The Mushroom Seat Mk II came about as a result of the original Mushroom seat meeting with and accident. Why its called a mushroom seat. In 2011 I made a simple garden seat from recycled pallet pine, this is what it looked like. Unfortunately the car fell on it. So advance seven years and and its time to make another so using my (htl) skills this is the result. The timber is Red Ironbark from a recycled house post. The seat frame is eight segments with a angle of 10 degrees. To set the required angle for the seat frame I used Matthias Wandels Splay angle setting chart. The chart provides an angle of 4.11 degrees and a blade tilt angle of 22.14 degrees. I/you cannot set the saw exactly so I just eyeballed it to the closest I could get. 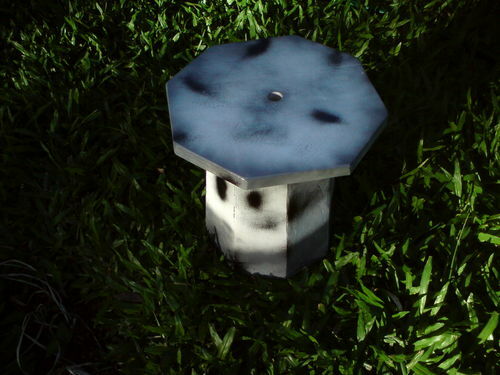 The base sections are 280mm high x 25mm thick, the widest is 120mm and the narrowst 80mm. The seat top consists of two pieces of timber 20mm thick joined at the center and measuring 265/290 mm depending where you measure from. The seat is attached to the frame by a tapered insert screwed together from inside, as I did not want any screws showing on the outside. With the seat in two sections I sanded everything starting at 60 grit and after some time finished with 800grit. The final seat was then simply just abrasive polished to the finish you see and then assembled. The results are typical of Australian Red Ironbark, and if it will support a house it will certainly hold up a car! Upon it being seen by somebody I was then directed to ensure it remained inside the house. (rats) and was not to be painted! There is a blog covering my dodgy construction methods if interested! 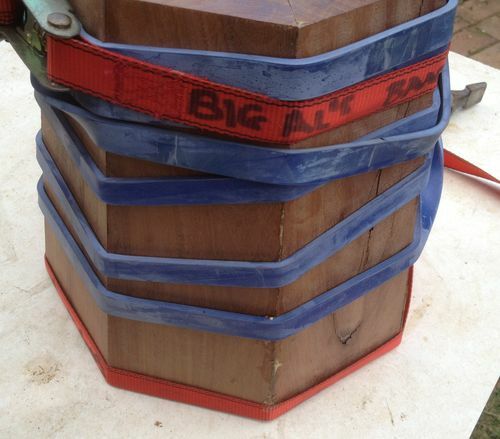 The band clamp system: Big Al, they live on! The parallel clamps: Degoose, they also live on! The timber: whoever threw out the posts after replacing them with steel ones! Cool stool. I like the history too. First class seat Rob and top use of old timber, well done sir. 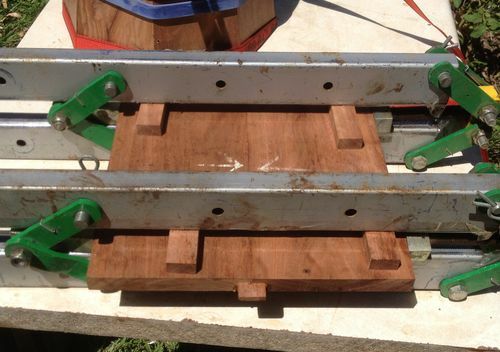 Great looking project, great joinery…pocket holes…very smart and fast. Ah the discussed Ironbark, Very unique! Swert: Thanks for the comment, as to why poeple huck this timber out is beyond me, I do Know I would hate to be having to pay for it, even if it is available in 150mm x 150mm size, no doubt Bob Wemm would know the answer. Crowie: Thanks Pete, pity the wife spotted it and annex it for inside, oh well Mk III is under way today. majuvla: Thanks also Ivan two dayds to do the job good thing I am not trying to make a living out of my passtime. Bob Wemm: Thanks Bob is the material still available in timber yards in WA? I know you would want a wheelbarrow of loot for it in QLD! Then having the tools to be able to work it is something else. 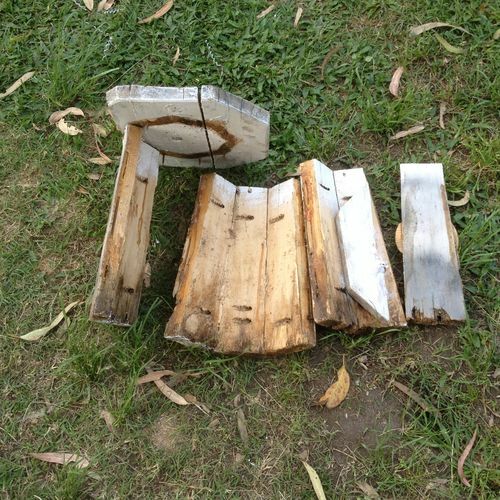 Andre: Thats the material buddy and now turned into some furniture, its a heavyweight thats for sure, dont drop it on your foot now as its 8 kgs at weigh in! Is there a similar wood product in Canada? I know Stefang in Norway said it was not something available there. Mate absolutely lovely that, and from recycled Australian timber even better. 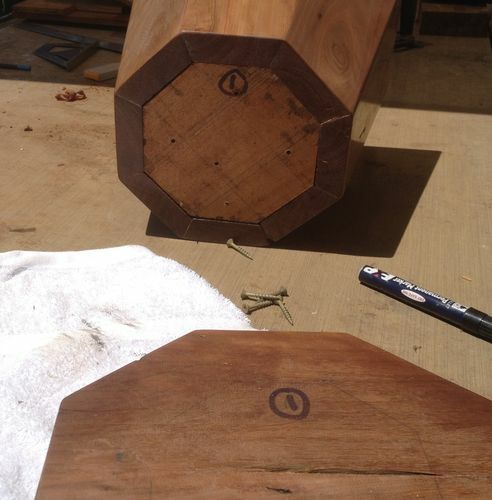 Not sure if some of the readers here would quite understand how hard that old iron bark is and therefore very very difficult to work with, For Example, if the screw holes arent the exact required diameter forget about getting a screw in it. Awesome little seat that I imagine will be around for a long long time. Well done Rob and really nice timber too. It’s a like for me! Nice work Rob! I once made a bucket for a wishing well and it looked like your stool base. I guess I could have turned it upside down and put a seat on it! No hardest local woods are Oak, Maple and Birch, most common in my area, Birch, Poplar, Spruce, Pine and Tamarack. Tony: I found your bucket!